When Hoover's free flights promotion was launched to a wide-eyed British public in August 1992, it seemed too good to be true. Over the next 21 months, many Hoover customers discovered it was. 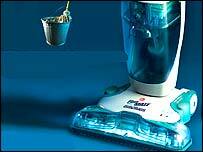 Originally intended to shift a backlog of vacuum cleaners and washing machines gathering dust in Hoover's warehouse, it ended up costing the company £48m and dragging their name through the dirt. The promotion was simply too generous. Spend just £100 on any Hoover product and two free return flights - initially to Europe - could be yours - though only if you were determined enough to make it through the maze of small print and Hoover's travel agents' attempts to sell you profitable extras designed to offset the cost of the promotion. As a marketing exercise it may have been flawed from the outset, but Hoover were slow to realise just how much trouble they were in and soon set about making matters worse for themselves. One day a judge would phone up, next day a professor, the next minute it was a pig farmer from Gloucester. While their travel agents for the European promotion struggled to cope with the overwhelming response, Hoover decided to launch a second promotion - this time to the USA. The TV ads for the US promotion reminded customers from the European offer to send in their vouchers and claim their flights. The tag-line was: "Two return seats : Unbelievable." Soon Hoover were inundated. The numbers just didn't add up and as the press started to dig Hoover found themselves drowning under a deluge of bad publicity. Ironically this made the offer still more popular. Customers were given another timely reminder to send in their applications and things went from bad to worse. Before long, disgruntled customers began to take matters into their own hands. Not liking to be done out of a bargain, the British public took up the cause with a vengeance. David Dixon, a horse trainer from High Seaton in Cumbria became a national hero overnight by kidnapping a Hoover van. To add insult to injury, the washing machine he'd bought to get the flights had broken down. "There comes a time when you've got to make a stand, when you've got to say enough is enough, he said. When a Hoover engineer came to fix the machine, a careless comment got him more than he'd bargained for. "He said 'If you think buying a washing machine's going to get you two tickets to America, you must be an idiot'," Mr Dixon recalled. "I said; 'I'm not as stupid as you are. I'm not going to have to walk home'." BBC Watchdog sent researcher Hilary Bell to secretly film in one of the travel companies with rudimentary equipment. "They said, 'don't worry the secret filming equipment will be incredibly unobtrusive, have no fear', so there I am the next day scared out of my brains and handed my secret filming equipment," Mr Bell said. But the equipment was hidden in an Adidas bag that was so large it threatened to give the game away. "I might as well have just worn a T-shirt saying Film Crew," said Ms Bell. What she uncovered would see resignations from Hoover's top management. Questions were asked in parliament as, across the country, others banded together, and the Hoover Holiday Pressure Group was formed. To my astonishment, the Royal mail van would turn up every day," said the group's founder Harry Cichy. "One bag to start with, then two bags, then three bags. We ended up with about 8000 members. "One day a judge would phone up, next day a professor, the next minute it was a pig farmer from Gloucester." The campaign dominated Mr Cichy's life for 6 years and took him to Iowa, the headquarters of Hoover's US parent. With the help of the pressure group, hundreds of customers began taking Hoover to court . Soon the company found itself fighting legal battles up and down the country in the small claims courts. The cases continued for six years after the promotion first started. About 220,000 people did eventually fly, but it went down in history as one of the greatest marketing disasters of all time. 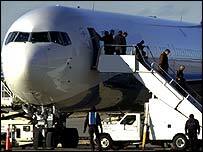 Trouble at the Top: Hoover Flights Fiasco was broadcast on BBC Two on Wednesday 12 May at 9:50 pm.